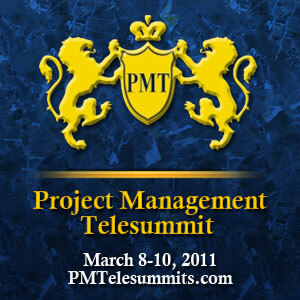 I am excited to be bringing you the first edition of the Project Management Telesummit on March 8-10, 2011. When budgets get tight, training and professional development are usually the first things out the door. Taking charge of your own training and professional development and investing in your future is the best way to create your own job security. The Project Management Telesummit is a live online “virtual” event where you will gain valuable insights from fifteen of today’s dynamic and engaging thought leaders in Project Management from the comfort of your home, office, or anywhere in between. This is an opportunity to be a part of 3 days of training at an entry price tailored for today’s tight training budgets. It is a great way to maximize your investment of training dollars. When you register for Project Management Telesummit, you can attend from virtually any location in the world that has an Internet connection and a computer with a Web browser. This is an ideal opportunity to get a conference experience without all the cost and hassle of travel. The theme for this first edition of this Telesummit is “Thrive”. The focus is on the insights you need to stay ahead and thrive despite today’s challenging and turbulent business climate. You will learn winning strategies for delivering successful projects, expand your skill set, and network with other project management professionals, practitioners, and thought leaders. Dr. Margery Mayer: Global Communications; what does it means in today’s business? Dana Brownlee: The Secrets to Running Project Status Meetings that WORK!! Bernardo Tirado: How Does Understanding Human Behavior Increase Your Project Success Rate? All Telesummit presentations are recorded. If you are unable to attend the live sessions, you can watch the recording when it is most convenient to you. 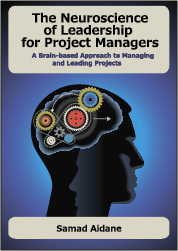 Be sure to take advantage of this opportunity to get the latest thinking, best practices, and real world leadership insights in project and program management. Plan to be engaged! Click on this link to get information on Registration, Speakers, and Agenda. Space is limited so early registration is encouraged. I do very much look forward to seeing at the Telesummit!